After seeing 4 stars on Yelp for Rice Bowl, Gabriel and I decided to give it a shot for dinner since it’s pretty close to our house. When we arrived, we found a sort of diner-looking restaurant with nondescript booths, and dim lighting…but hey, what can you really expect in a strip mall asian restaurant? We decided to each order an entree- they both came with salads and rice, and to share an order of edamame and an order of Japanese vegetable rolls. When we asked for the vegetable rolls, the waiter was clearly very confused and had not heard of that before. Huh? Really? Isn’t that a totally common sushi item? I guess not. He asked what should go in it and we told him that it’s usually a combination of cucumber, pickled vegetables and avocado. It was eh…the sushi rice was kind of old tasting and the ginger was icky…the veggies were alright, but nothing special. The edamame was fine- but it’s pretty tough to mess that up unless you really over cook it. The salad was pretty bad. Waaaaay too much mayo-y dressing over iceburg. Lame. I have to say that I was pleasantly surprised when it came to my entree. 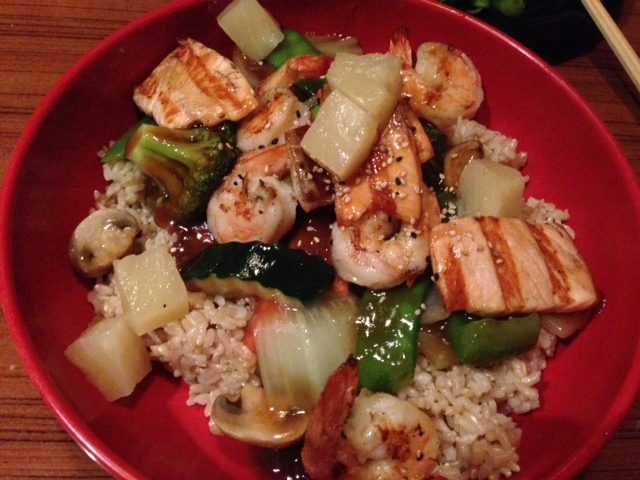 I had the Tropical seafood rice bowl which was shrimp, salmon and fresh veggies in a sweet and sour type sauce. The seafood was much fresher than I expected, and the veggies were cooked perfectly. It was a generous portion and really quite good overall. Although I wasn’t impressed with the apps, or the atmosphere, I liked my entree a lot and the price was super reasonable. I don’t think I’d go eat there again, but I would definitely do take out.